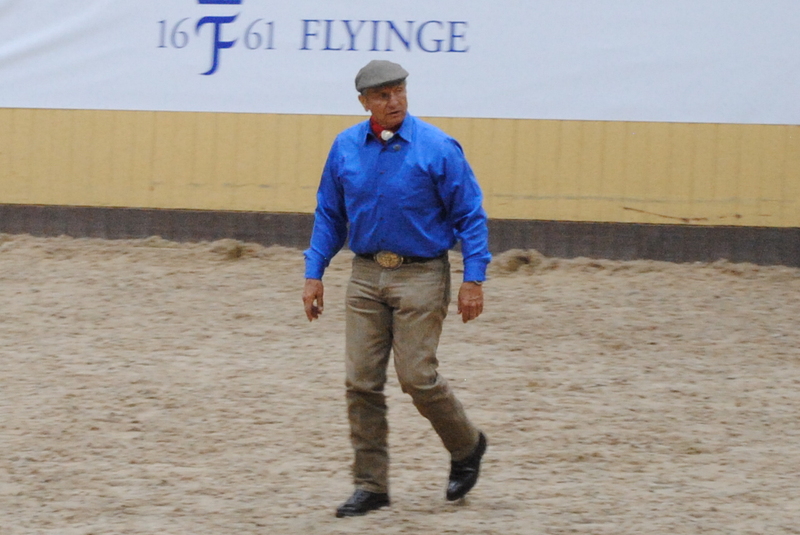 Last Saturday we took the opportunity to visit Monty Roberts clinic at Flyinge in southern Sweden. It was beyond doubt a great experience to see this seventy-eight-year-young legend in modern horsemanship and to listen to his wisdom. 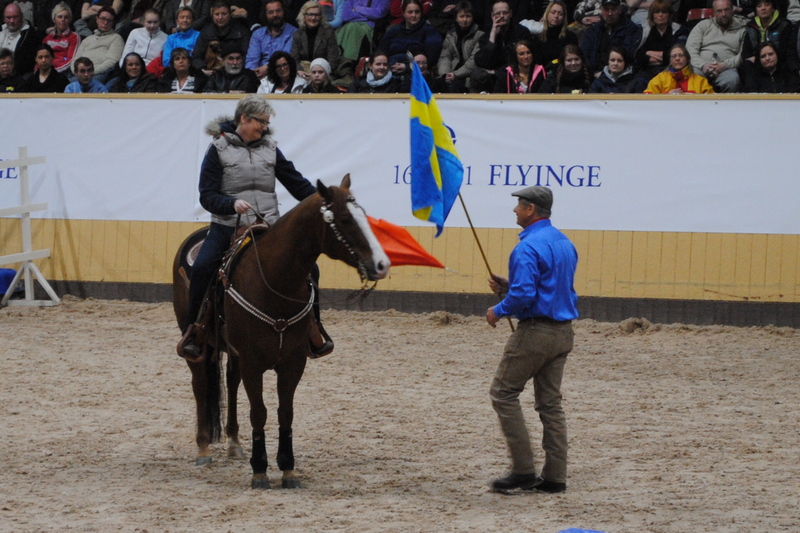 Monty returned for this clinic at Flyinge with its 350 years as horse breeding and training facility, formerly for the Royal Swedish Cavalry. He spoke about the importance of seeking improvement and not relying on tradition when it comes to horsemanship. He also gave Sweden credit for being a lead star when it comes to the non-violent ways of working with horses. He started out with a fresh two-year-old, pointing out that he had never before touched any of the horses he will be working with tonight, only given the opportunity to watch the horses while talking with the owners. The demonstration of his hallmark, the join-up and follow-up technique was awesome. The handsome young colt entered the stadium with a pounding hearth and was calmly walked into the round pen by a lead rope looking insecure and vulnerable, staring with big anxious eyes at the audience of almost 1500 people, as we were holding our breath in silence; a few others were applauding frenetically. Note that the photos show the five year old, not the young colt. Monty set the horse free and made the young horse trot about five hundred yards in the roundpen “away from his herd”, about five laps in each direction, until the horse “asked” Monty to let him return to the herd; the horse lowered his head and began chewing lightly. Monty demonstrated how he could increase the speed of the horse by just holding up his hand and spreading his fingers, then as he closed his hand the horse slowed down. Monty then lowered his own closed hand and bent his arm in toward his body and lowering his head slightly turning away from the horse; the horse immediately stopped and turned towards Monty and slowly walked right up to Monty totally calm and relaxed. Magical! The horse now had all his attention to Monty. The power of relief a horse gets when we turns away from him is very strong. A predator that approaches and then walks away can’t be dangerous, it makes the horse feel very relieved. He had been convinced that the safest place in the round pen, and in the entire stadium, was by Monty. 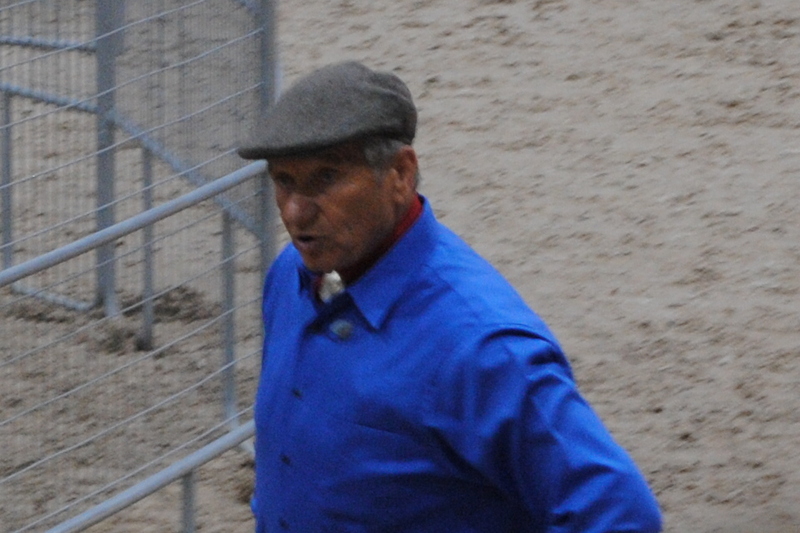 Monty Roberts then worked the horse with a Dually halter, talking about picnic; positive instant consequences, negative instant consequences, while building confidence and trust. Finally the horse was ready for a saddle pad and a saddle, again he made the horse walk and trot a few laps around the pen letting the horse finding out that it was alright. Then followed a demonstration of lunging with the Dually halter working as a kind of side-pull learning the horse to turn easily almost without resistance. After that it was time for the Irish assistant Adrian. The first time a horse is mounted it is done in three steps. First the rider is lifted up to hang over the saddle a short moment to let the horse feel the weight. Then the same procedure, but Monty now leads the horse to take a few steps. The final step the above is repeated and then the rider puts his foot in the stirrup and sits up. He walks a short ride around the pen and then quietly dismounts. This first session took less than an hour and the young horse surprisingly calml left the arena looking confident and proud. Mr Roberts then went on to work with different horses. A small pony very afraid of practically everything especially plastic bags, a five year old horse who had thrown off every rider who had ever tried to ride him and a horse who refused to be loaded. Monty effectively solved all problems without any violence or discomfort, leaving all horses calm and settled. The last horse was equipped with a device to measure the heart rate which was displayed on a screen. Even if there were some technical problems, it nevertheless showed that the hearth rate slowed down as Monty made the join-up and then worked the horse with the Dually halter, contrary to what critics has suggested. 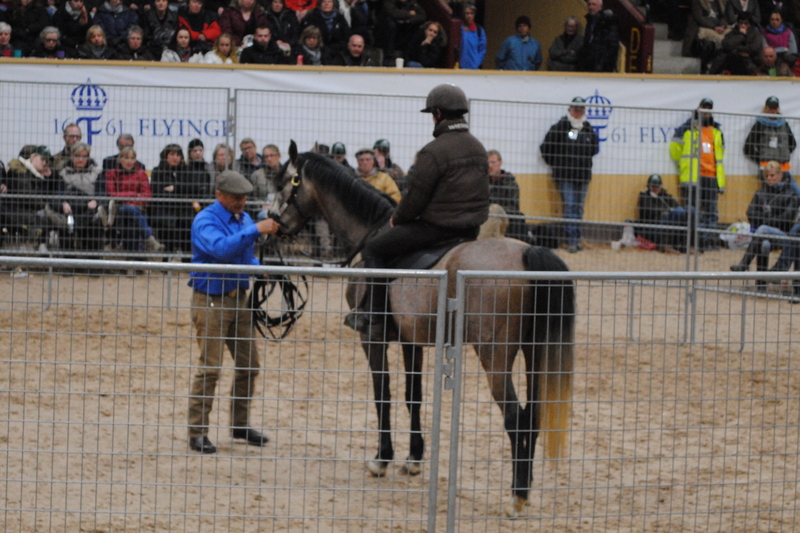 Monty Roberts way of first getting the horses fully attention and then building confidence and trust is the whole trick, after that is established the rest of the job seemed easy. It looks simple and it really works. With some talent and hard persistent work it only takes about half a century to get the hang of it. Monty Roberts is not the only one using a similar technique, gentlemen like Ray Hunt and Buck Brannaman and many others following the same path has set a standard of non violence that is now the prevailing way of working with horses. 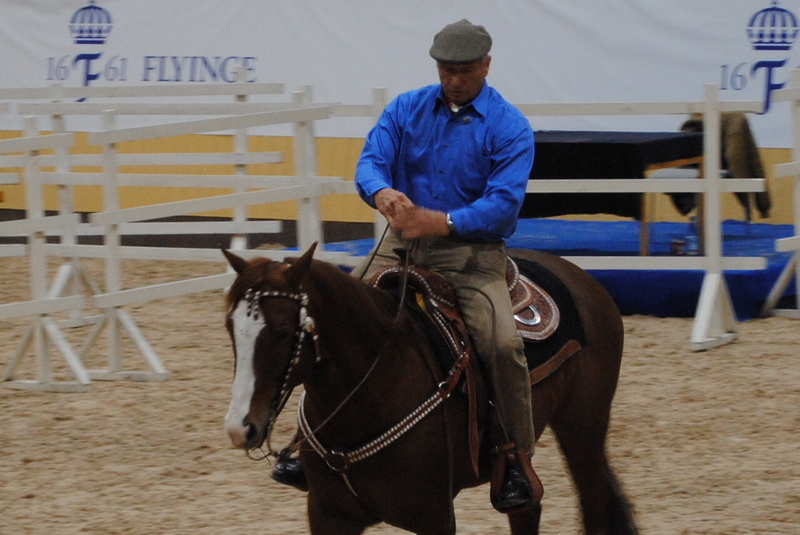 Monty Roberts has a personality that not only makes horses trust him, he is a one of a kind, down to earth superstar and it is a privilege to have met him. After the show he promised to remain at the signing stand until somebody asks him to leave. In spite of the somewhat commercial touch of the whole event Monty gives a true impression. Compared to other shows by various famous performers and sports stars I must say an evening like this is well worth its price. 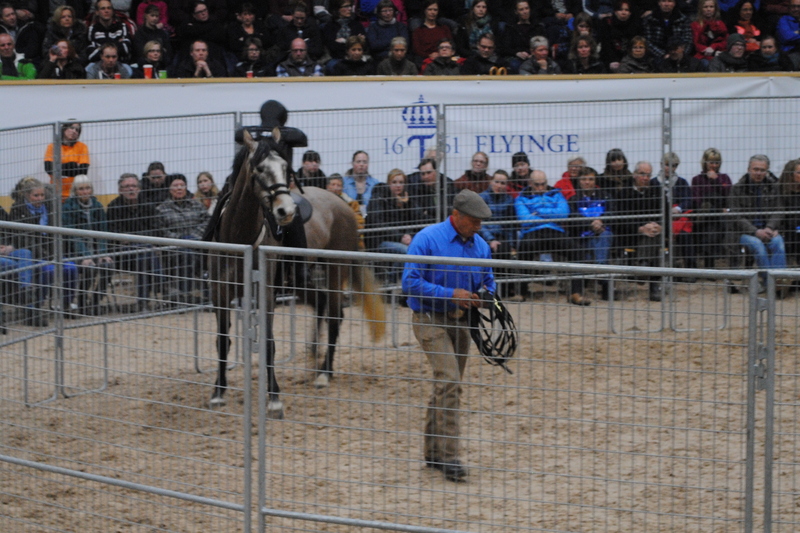 Aside from being a good show the audience learns something that can make a difference for many horses. When we walked back to the truck for the three hour drive back home to our Nokota Horses I could not help thinking about how different the reality is for Leo and Frank Kuntz and all the volunteers that put their lives into preserving the Nokota horses; just as skilled horsemen and horsewomen, but no glory and no fortune, just hard work for the love of wild horses. (Of course that also goes for many other wild horse volunteers on different locations, like The Pryor Mountains, etcetera.) The earnings from just one show like the one we saw tonight would support the horses of The Nokota Horse Conservancy for a pretty long time. It struck me that it was the charity part, in favor of horses in need, which was missing from an otherwise perfect show.